Editor’s Note: If you cannot see the forest for the tress, it is time to take a broader view and reassess. This study tracks changes in educational philosophy and training programs in Taiwan for the past 20 years. The Taiwan technology education started in the Chin dynasty. The educational goal changed from vocational exploring to industrial culture reorganization as well as teaching technology literacy to students. Imitating the United Stated of America, Taiwan's technology education emphasized and cultivated labor habits, but now there are big differences between Taiwan and United States of America in implementing technology education. The purpose of this study was to explore the trend of technology education in Taiwan. This study used "Taiwan Periodical Literature" as the inspection tool, and did content analyses of the papers with "technology education" in the title. Two hundred and seventy two papers were selected from eighty journals between 1976 and 2009. Four major findings were identified. The result of this research will offer the trend of Technology Education as the result for reference in any further study. In keeping with social development, Taiwan had moved from labor intensive agriculture and industry to the post industry society of science and technology orientation. As Zhang (1999) said: “Technological changes play a key factor in social and economic development so that people's knowledge, attitudes and abilities about technology influence the choices for national development. Taiwan technology education started from Chin dynasty. Its educational goal changed from vocational exploring to industrial culture reorganization as well as teaching students technology literacy. Imitating the United Stated of America, Taiwan's technology education emphasized cultivating labor habits, but now there are big differences between Taiwan and United Stated of America in implementing technology education. Taiwan did not specifically set up organization of teacher education and academics for technology education in 1952, before the establishment of Taiwan Normal University (now known as the National Taiwan Normal University) Department of Industrial Education. After the establishment of the Department of Industrial Education and the growth of Taiwan's technology education into an organized and systematic discipline, the Department of Industrial Education in the United States assisted in the development of Taiwan's industrial arts education. The Industrial Education Department has trained with professional teachers who implemented industrial arts education in the past and technology education now (Chang, 2005). Taiwan's technology education was patterned on the educational technology in the United States, however, where the current status of technology education and implementation is concerned, Taiwan is lagging behind the United States (Lin, 2003). Since 2001, Taiwan has been engaged in curriculum reform. The Ministry of Education divided all subjects into seven major fields of study. Before the Grade 1-9 Curriculum Reform, technology education in grades 1-6 was integrated into "Arts and Crafts" and was typically taught by art teachers. Even with the latest reform, the program lacks competent teachers to teach it, and the credit hours of the technology education program have been almost cut in half. Technology teachers are finding it more and more difficult to allocate time to technology education because "Science and Technology" is often dominated by science educators (Fang, Teng & Chen, 2007). Technology education began to take root in Taiwan, but did not thrive. After the implementation of Grade 1-9 Curriculum Reform, the status of technology education was questionable in Taiwan: (a) ineffective in education reform, (b) the qualities of teacher education were uneven, and (c) equipment was not complete and could not be sustained (Chiang, Weng, & Lo, 2008). According to Shavelson and Towne (2002), the advances in scientific knowledge are achieved through long term scholarly efforts of the scientific community to create new understanding in the form of models or theories that can be empirically tested. Accumulation of scientific knowledge over time is non-linear and indirect, and often involves highly contested or controversial results that undergo professional scrutiny, skepticism, and criticism. Through this process research results are questioned, studies are replicated, and results confirmed or rejected and, therefore, multiple studies using multiple methods in varying contexts are needed to establish a verifiable base of understanding (Johnson & Daugherty, 2008). Moreover, the U.S. Department of Education (2007) published the Report of the Academic Competitiveness Council. This report addresses concerns within the science, technology, engineering, and mathematics (STEM) disciplines that focus largely on research methods (Johnson & Daugherty, 2008). For the above reasons, the purpose of this study was to explore the trend of technology education in Taiwan. This study used "Taiwan Periodical Literature" from 1976 to 2009 as the inspection tool, content analyzing the papers that were titled with "technology education". The following questions were explored to accomplish this purpose. What types of research have been used in technology education in Taiwan? What research methods have been most commonly used in technology education research in Taiwan? What types of population groups were represented in technology education research in Taiwan? What types of data were collected in technology education in Taiwan? What types of research focus have been conducted in technology education in Taiwan? § 3W (what, where, when) and 1H (how) to research. It is necessary to plan around student learning of key technological ideas (concepts) and skills (processes) identified for literacy (AAAS, 1993; ITEA, 2000). § Curriculum materials and classroom instruction. § Common issues with researchers in science and mathematics education. § Teachers themselves understand-or come to understand-technology. § Determine the most efficient and cost effective ways to provide competency for technology educators. § Educational research methods can vary greatly, case studies would be useful to create an adequate basis for later formal research. Primary research focuses including teaching, learning, curriculum, opinions-attitudes, design, problem solving, assessment-evaluation, gender-race, professional development, educational technology, and completion-retention. Type of research methods including descriptive, interpretive, case study, quasi-experimental, correlation, causal comparative, Delphi, and protocol analysis. Primary data sources including students, teachers, professionals, college faculty, administrators, documents, graduates, parents, and general public. Primary data types including self report, perceptions, observable behaviors, test score, documents, verbal protocol, and archival data. Taiwan's industrial arts/technology education is in the process of evolution, most of the development of the United States is the same. Although in existence for a short time, it is still based on the principle of American development as a reference. Strictly speaking, Taiwan's technology education curriculums in 1993, were revised in the beginning, then again after a short time and then again after five years of reform. Although the curriculum name is the same, the curriculum objectives and content are very different with a two-stage living technology. It should not be classified as the same curriculum, or else the outside world find it difficult to understand the nature of life science and technology curriculums. Even life itself is difficult to adapt to new technology, teachers and cognition (Lee, 1986). See Figure 1. Industrial arts/technology education curriculum has evolved and, at different times, has had different objectives and curriculum content (Yu, 2005). In comparison of “process and technology”, and “education” as two different concepts, (such as comparing the living technology with the nine-year old living technology), living technology curriculums can be found to have had great change in just five to six years, and therefore extend a number of related issues, such as teachers’ distress and problems with adaptation, teaching materials, classroom planning, and teacher professional development. These problems must be solved immediately. 1. To train for interest in science, develop the habit of constant study. 2. By Learning the Science and Technology of the inquiry approach and the basic knowledge, students can apply their knowledge in current and future life. 3. To train for loving the environmental resources and have an attitude of respect for life. 4. To train for independent thinking, problem solving skills. 5. To explore the interaction between people and technology. Table 1 for the three stages of curriculum: objectives, content, and implementation methods, a comparison can be found: the teaching goal is to follow the evolution of social changes and response measures derived from the use of skilled technical training tools, from the bottom of the inherent right to technology to realize the conservation of culture, the last to develop and adapt to society as the goal of fostering the capacity-building approach to target the needs of today's social scientific and technological personnel, but also significant considerations tend to solve problems, curriculum change and social development of technological process to each other. The computerization periodical was borrowed from the "US Electronic Information Exchange System" plans in 1976 (Turoff and Hiltz, 1982). The Taiwan National Library started in 1970 to distribute the paper book, "Taiwan periodical paper citation index", and, in 1998, distributed the World Wide Web (WWW) altogether to include the periodical 4,813 journals, and 2,286,495 papers in December 2009 (Taiwan Periodical Literature System, 2010). 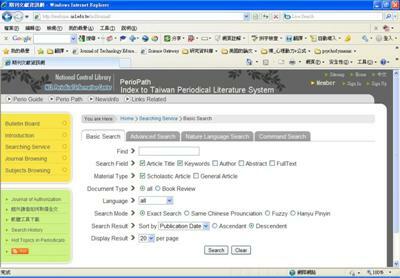 "Taiwan Periodical Literature System" is mainly offered in Chinese and foreign languages in Taiwan, published in academic journals, professional journals, journals and some journals published in Hong Kong and Macao, which contain contents that can be divided into scholastic articles and general articles, including the rigorous review by the National Science Council of the TSSCI (Taiwan Social Sciences Citation Index, i.e., Taiwan's SSCI) journals (showed in Figure 2). The samples for this research were selected from "Taiwan Periodical Literature" about "technology education" title from 1976 to 2009 in Taiwan. The totals of 272 papers were selected to this study-content analysis. The first step in planning the study is to define the problem. Whenever new ideas appeared, the researcher discussed these with the advisor in order to understand the possibility of transforming the ideas into the research topic about "technology education". The material which is collected makes the record. It also serves as a permanent record of the original study objectives and the study methods and procedures. Compute for frequency and percentage of category. Content analysis is a research technique that can produce insightful and valid inferences from "naturally" occurring raw data of textual materials (Shi et al., 2006). Neuman (1997) defined content analysis as: A technique for gathering and analyzing the content of text. The "content" refers to words, meanings, pictures, symbols, ideas, themes, or any message that can be communicated. It defines the analysis units and establishes the categories, that is, the outstanding repeated elements, for analyzing the raw data (Frank, 2005). Content analysis of published articles in academic journals has been conducted in a variety of professional fields where these studies provided insightful information about overall research trends and identified important scholars and papers (Shih, Feng, & Tsai, 2008). It is primarily concerned with the study of basic concept categories, which occur in any text or document which the researcher searches for structures and patterned regularities in the text and makes inferences on the basis of these regularities (Gokhale, Deokattey, & Kumar, 2006). Content analysis including three steps: open coding, axial coding, and selective coding, it would be step by step to complete. Content analysis, a research method, is consistent with the goals and standards of survey research. In a content analysis, an attempt is made to measure all variables as they naturally or normally occur. Some types of random sampling of the units of data collection is typical, making the findings generalized compared to a larger grouping or population of messages (Holsti, 1969). Therefore, the process of coding is basically one of selective reduction, which is the central idea in content analysis (Prasad, 2009). PA stands for "proportion agreement, observed," X is the number of agreements between two coders, and Y and Z are the number of units coded by coders Y and Z, respectively. This statistic also ranges from .00 (no agreement) to 1.00 (perfect agreement). Table 4 and Figure 3 illustrate the number of studies on "technology education" from 1976 to 2009. In the longitudinal aspect, the number of studies on "technology education" has decreased in recent years. From the quantitative data, the number of studies from 1976 to 1980 (7 papers, 2.57%), from 1981 to 1985 (5 papers, 1.84%), and from 1986 to 1990 (3 papers, 1.10%); then comes from 1991 to 1995 (95 papers, 34.93%) and from 1996 to 2000 (95 papers, 34.93%), these two groups of papers were the most, and finally, comes from 2001 to 2005 (49 papers, 18.01%) and from 2006 to 2009 (18 papers, 6.62%). Actually, from 2001 to 2005 the number of papers on "technology education" decreased about 41.08%, and from 2005 to 2009 the number of papers decreased about 63.24%. Table 5 showed the shifts of categories from 1976 to 2009. The categories "Technology education concepts" and "Foreign technology education" ranked top two, with the number of studies of 94 and 49 of the total research papers. The category, "Technology education concepts", consistently ranked top one from 1976 to 2009 with an average of 34.56% of the total research papers. This category had a descending trend within these years. The category "Foreign technology education" also ranked top two from 1976 to 2009, with an average of 18.01% of the total research papers. Otherwise, the category "Technology education for teacher education and training" consistently ranked last one from 1976 to 2009, with an average of 1.10% of the total research papers. This study used the "Taiwan Periodical Literature" as the inspection tool, and content analyses of the papers that were entitled “technology education". Two hundred and seventy-two papers were adapted from 87 journals between 1976 and 2009. Four findings were concluded. The result of this research will offer the trend of Technology Education as the result for the reference of further study. After open coding, implements axial coding, and by ITEA(1995) and Cajas(2000) proposed that suggested to the technical study and the technology education's research, discovers common and the different point, the concept changes into nine categories. The category "Technology education for teacher education and training" consistently ranked last from 1976 to 2009, with an average of 1.10% (only 3 papers) of the 272 papers. From the quantitative standpoint, the numbers of studies from 1991 to 1995 and from 1996 to 2000 papers were the largest: 95 papers which equals 34.93% of the total papers. These results were consistent with 1990s Jackson's Mill II and the ITEA "technology is human innovation in action" in 1995. The technology education papers decreased from 2001 to 2009 gradually: From 2001 to 2005 the technology papers decreased about 41.08%, and from 2005 to 2009 these papers decreased about 63.24%. The reason for the number decrease is that the technology education curriculum entitled, "Living Technology Curriculum" from 2001 to 2005was renamed in 2005 to "Domain of Natural Science and Living Technology: Living Technology Curriculum". Therefore, the number of researches in technology education was substantially reduced. Cajas, F. (2000). Technology education research: potential directions. Journal of Technology Education, 12(1), 75-85. Chang, C. H. (2005). Technology Education in Junior–high School-based Curriculum Development. Unpublished MA Thesis. Department of Industrial Technology Education, National Taiwan Normal University. Chiang, W. J., Weng, Y. Z., & Lo, Y. H. (2008). The reflection of technology education in Taiwan from the Finnish experience. Living Technology Education, 41(6), 37-48. Fang, R. J., Teng, C. C., & Chen, C. C. (2007). How Taiwanese and Americans Think About Technology. Journal of Technology Education, 18(2), 7-23. Gokhale, P. A., Deokattey, S., & Kumar, S. (2006).Accelerator driven systems (ADS) for energy production and waste transmutation: International trends in R&D. Progress in Nuclear Energy, 48(2), 91-102. Holsti, O.R.(1969). Content analysis for the Social Sciences and Humanities. Reading, Mass. Johnson, S. D. & Daugherty, J. (2008). Quality and Characteristics of Recent Research in Technology Education. Journal of Technology Education, 20(1), 16-31. Lee, L.S. (1999). The Grade 1-9 curriculum,teaching,review of science and technology domain. Journal of Living Technology Education, 32(5). 2-6. Lee, L-S. S. (1986). Development of industrial arts curriculum for junior high school in Taiwan. Industrial Arts Education, 19(5), 2-10. Lin, K. Y. (2003). United States and Taiwan's technology education paragon comparisons. Living Technology Education, 36(6), 18-27. Ministry of Education in Taiwan [MOET] (2000). The Ministry of Education 1999 Progress Report. Implementation of Guidelines for a 9-Year Joint Curricula Plan for Elementary and Junior High Schools, Mar 1, 2010. Retrieved from http://english.chna.edu.tw/ct.asp?xItem=7042&ctNode=784&mp=11. National Research Council [NRC]. (2002). Investigating the influence of standards: A framework for research in mathematics, science, and technology education. Committee on understanding the influence of standards on K-12 science, mathematics, and technology education. Washington DC: National Academies Press. Neuman, W. (1997). Social research methods: qualitative and quantitative approaches. Needham Heights, MA: Allyn & Bacon. Prasad, D. (2009). Empirical Study of Teaching Presence and Critical Thinking in Asynchronous Discussion Forums. International Journal of Instructional Technology and Distance Learning, 6(11), 3-26. Queensland School Curriculum Council (QSCC). (2000). Technology: Years 1–10 syllabus-in-development pilot draft. Terms 1 to 3, 2000. Brisbane: The State of Queensland. Savage, E., & Sterry, L (1990). A conceptual framework for technology education. The Technology Teacher, 50 (1), 6-11. Shavelson, R. J., & Towne, L. (Eds.). (2002). Scientific research in education. Committee on Scientific Principles for Education Research, National Research Council. Washington, DC: National Academies Press. Shi, S., Mishra, P., Bonk, C. J., Tan, S., & Zhao, Y. (2006). Thread Theory: A Framework Applied to Content Analysis of Synchronous Computer Mediated Communication Data. International Journal of Instructional Technology and Distance Learning, 3(3), 17-38. Shih, M., Feng, J., & Tsai C. C. (2008). Research and trends in the field of e-learning from 2001 to 2005: A content analysis of cognitive studies in selected journals. Computers & Education, 51(2), 955-967. Stein, S. J., McRobbie, C. J., & Ginns, I. S. (2002). Implications of missed opportunities for learning and assessment in design and technology education. Teaching and Teacher Education, 18(1), 35-49. Towne, L., Wise, L. L., & Winters, T. M. (Eds.). (2005). Advancing scientific research in education. Committee on Research in Education, National Research Council. Washington, DC: National Academies Press. Turoff, Murray and Hiltz, Starr Roxanne.(1982). The Electronic Journal: A progress Report. Journal of the American Society for Information Science, Vol. 33, pp.195-202. U.S. Department of Education. (2007). Report of the Academic Competitiveness Council. Washington, DC: Author. WANG, D.M. (2007). The elementary school science and technology educates the creation thinking curriculum design. Journal of Living Technology Education, 40(2). 11-17. Warner, S.A. (2003). Teaching design: Taking the first steps. The Technology Teacher, 62(4), 7-10. Wicklein, R., Smith, P. C., Jr., & Kim, S. J. (2009). Essential Concepts of Engineering Design Curriculum in Secondary Technology Education. Journal of Technology Education, 20(2), 65-80. Yu, C. (2005). Study on the development of industrial arts education in Taiwan. Taipei: Chuan Hwa Book CO., LTD.
Zhang, Y. H. (1999). The survey of teachers college students” technological attitude - Take national Hualien Teachers College as an example. NHLTC Magazine, 8, 297-31. Zuga, K.F. (1989). Relating technology education goals to curriculum planning. Journal of Technology Education, 1(1), 34-58. Dr. Jia-Rong Wen is a Distinguished Professor at SHU-TE University in Kaohsiung, Taiwan. He specializes in technology education, information & computer education, distance education, e-Learning. His current research focuses on the development of technology education and e-Learning for teaching and learning. Sheng-Huang Kuo is a PhD. Candidate in Educational Technology Division, Department of Industrial Technology Education, National Kaohsiung Normal University, Kaohsiung, Taiwan. Dr. Wen is his Advisor. His research interests include technology education and e-Learning.